Sew Slowly: Not looking a gift horse in the mouth. I don't know if this is really a progress post: I am still making bits and playing around with them on the floor, sewing together long 4 patches and 9 patch sets of squares, but very few firm decisions have been made. There are lots of combinations I like, like this one. On that basis, I could just not bother to post until I have something clearer to share, but a thought occurred to me that seems worth writing down. 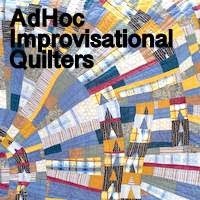 For me, a bit part of the improv process is about looking for the rhythm of a quilt. This is largely about repetitions of shape and colour and how you can use them both to move the eye around the quilt and to provide stopping points or pauses in that movement. So the notes I mentioned last time were really about the elements that I thought needed to be repeated more often in order to help build that rhythm. What I particularly noticed yesterday and want to mention is that it also helps to pay attention to what is happening that is incidental or accidental. In this case, I laid out several versions where the brown striped fabrics ended up making wonky windmill shapes. In all the ones you can see in the photos above, these shapes are made from a combination of rectangular pieces and squares, so they blur the lines between those two different blocks (if that makes sense). I didn't do this on purpose, it's just how things fell, but I like them and now that I've noticed I will make an effort to look for pieces that let me add them deliberately. This is what I mean when I talk about a quilt having a mind of its own. My quilts talk to me too, and tell me exactly what they need!! But they do it their own sweet time, don't they!? Love your progress! Making a quilt top look random is hard! I think you hit a winner with the mix of rectangle and square blocks. I also admire how clean your floor is! My kitchen floor - well, it needs some serious attention! LOL!!! It's the fun secondary effects like those windmills that can really draw you into a work to see the other details, too. It's fun when you find something like the windmills and noting how it works for you! I think that is so exciting about making quilts - the parts of it are only some elements of something that can be completely different. Even with traditionell patterns you find this but mainly with improve quilts. That´s this surprise moment I love. you made good progress and it will become brilliant. I see an orange butterfly and a navy butterfly. I totally agree! Serendipity is a really important part of the improv prosess for me too. It's really the most fun part . Adding, subtracting then looking again to see what pops out. I think of Rhythm in design like different dances; sometimes a quilt is a waltz and sometimes it's a mamba, that is sometimes your eye glides smoothly over the surface and sometimes it jumps about from hot spot to hot spot! Yes to what cspoonquilt said! The rhythm is always different quilt to quilt, but much like dance motions. :) Love the unexpected repeats in your design! Your post highlights issues related to improvisational work. I had not considered the effects of using different size blocks other than just fitting them together. How interesting to find truly unique and unexpected secondary designs. I went back and forth through your photos and text several times to see what you wrote about. Thanks for sharing this enlightening post. You know I always enjoy watching your process, bit by bit, but I also appreciated your description of it in this post. Finding the rhythm, noticing and capitalizing on the incidental or happy accidental. Great stuff. It is interesting how everyone has related to different parts of what you said! To me, the key point is that you saw something you liked, and decided to build on that. I think that freedom is what draws people to your quilts, and to improv in general. Great post!